My first quarter of 2011 was already totally done in before 2010 could end. 2 months into the new year and I am already in a daze.... I can't imagine how I could have travelled to Bangkok, India, Australia, Shanghai, Korea, celebrated Chinese New Year and still blog in the last 2 months... Just 2 weeks ago, I had been given a new assignment by the Singapore office. With our office lease expiring this year, we are now evaluating our next office space option. I sit on the office project committee and have been given the enviable task of being responsible for the interior design of the office. I love tasks that allow me to spend other people's money, especially one that lets me work with aesthetically pleasing items. I knew I wanted a clean and fun modern decor for our office,inspired by the colourful and fun spirit I had seen once at the Google office. When CSN notified me that they had expanded yet again their sites to include AllModern.Com, I immediately went on-line to gather inspiration. So many things caught my eye but these bean bags, in particular were unforgettable. If CSN would ship these to Singapore, I would order these for the new office in a heartbeat! 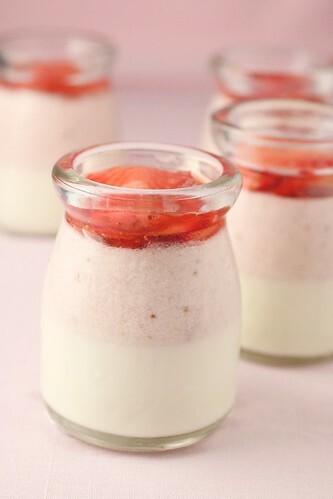 I imagine these bean bags going into our cosy corner where we can chill out and unwind - occasionally I can bring treats like these Strawberry Soy Pudding and have my colleagues be my taster.... Dreamy satisfaction. These puddings were made with the remaining strawberries I had lugged back from Korea. No longer as fresh and luscious as they were last week, I decided to incorporate them into a strawberry mousse and marinated the sliced strawberries in a syrup for garnish. To keep this a light dessert, I had also chosen to work with a soy pudding base - with a texture that is very similar to the soya bean curd. 1. Place sugar and soya milk in a saucepan and heat until sugar dissolves. Turn off heat. Add in softened gelatine sheet and stir until completely dissolved. 2. Run (1) through a fine sieve into a mixing bowl. 3. Cool down (2) over an ice bath and add in liquid fresh cream. 4. Fill half a glass/ jar with the soymilk pudding and refrigerate until set. 1. Puree strawberries in a blender. Add lemon juice to Strawberry puree. 2. Mix gelatine powder with water until it turns transparent. 3. In a saucepan, heat milk and castor sugar until sugar dissolves. Turn off heat and add (2) and stir until dissolved. 4. Sieve (3) through a fine sieve and cool over an ice bath. 5. Add (1) to (4). 6. Whip fresh cream until soft peaks are formed. Fold the whipped cream into (5). 7. Scoop (6) into jars with set soymilk pudding. Refrigerate to set. 1. Cut strawberries into slices or sections. 2. In a heavy saucepan, add water and sugar. Heat until sugar dissolves. Continue heating to reduce syrup until volume is halved. 3. Add lemon juice into (1). Add the hot syrup from (2) to the strawberries. Refrigerate and keep overnight. 4. 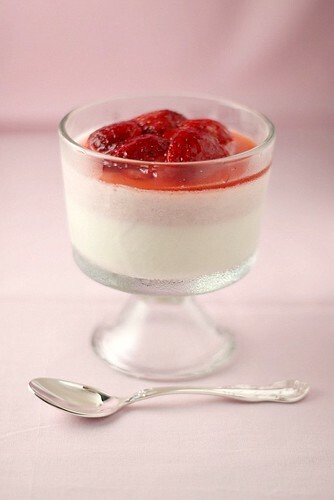 Use marinated strawberries as garnish and scoop a little syrup over the set pudding. You've certainly had a busy start for the year! Love this pudding, especially because it's made with soymilk! They look so pretty! I love how you use little glass bottles for the mousse :). Great use of the remaining berries. I bought some Korean strawberries from CS last Sunday but haven't tried them yet. If good I might get more to make a panna cotta. Now where did you get those cute little pots?? Fiou..I am tired for you! Bean bags were my era..non? Shirley, these look so elegantly beautiful! I love the vessels used to contain the multicomponent dessert, too! You're such a capable lady, I'm sure you can pull everything off, real well. @Monique-bean bags are evergreen! ...just like u! Lovee this soy pudding! I have never made it with soy milk before! Lovely soy pudding and oh my, you are indeed a superwoman! Admire your energy and flexibility and ability to juggle the complexity of life! Keep it going especially your food blog! They are always so interesting to read! Love your soy dessert and the pictures too! 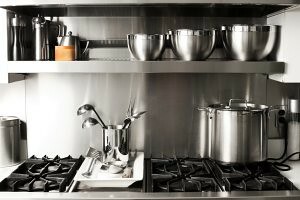 can i replace the gelatine sheet with gelatine powder? thank you! @Jasmine, yes, you can replace gelatine sheets with powder. I believe the same amount would do but I would add a little more, just in case. Also with gelatine powder, you will need to dissolve it in a little water. 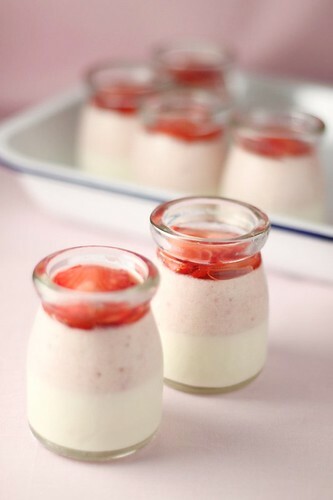 (for the strawberry mousse, I used 8g with 50ml water) I suggest for the soy pudding, you replace with 5g gelatine powder in 25g water. The powder will not exactly dissolve. It will turn transparent and become a little swollen. This little pots of deliciousness are so wonderful and dainty! Shirely, you are superwoman, with your busy schedule you are still able to update your blog. I always love the presentation of your dishes and desserts, to serve the pudding in these glass bottles looks especially special and unique, nice! they look so elegant and delicious. torn between admiring this beautiful dessert and dipping my spoon into them and mess it up! You are a superwoman. Each week you will fly to different places. I love the cute little jars and beautiful presentation. I can't wait for spring and summer to enjoy all the fresh berries. Lucky coworkers! 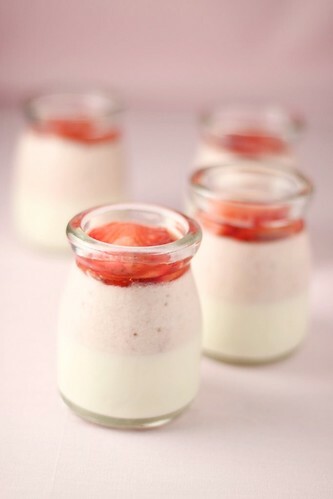 Delicious dessert and beautiful little jars. Your group of colleague is a one lucky group. @Lisa - :) if you are staying here, I will be happy to have you as my taste tester. totally dig the cute miniature jars! and it's totally awesome to be decorating your office - i would love to be in your shoes right now! Please pass me one too! The little jars are so cute! Haha, if I could spend other people's money on food I'd eat all natural, organic food all the time. It'd be sweet. Very elegant and pretty desserts. The flavours sound awesome too. Btw, where did you get those glasses? Hi Jo, I got those glasses from China many years ago. I got like a dozen of them and am glad that I could finally use them and give them away! Taken too much space in my cupboard! Hi Shirley I think you have a lot of energy to travel so much! These little jars of pudding look delicious! I envy your colleagues! I just want to report back that the ones I got from CS is neither sweet (at least not sweet in my books) nor sour. For God's sake I want me some sweet strawberries! Pickyin- Quick! Buy a ticket and fly to Korea - you will still be in time to get sweet strawberries! These little pots are just too adorable! Where did you get them? Also this soy pudding is such a refreshing desert, yum! Bee Bee, looks like everyone likes the milk bottles... I got them in China. $0.50/piece. Ok. I will bring back a carton on my next trip there and distribute them here in Singapore! I had NO idea that you were traveling so much! Amazing! How did you have the time to do all that and blog? This pudding looks amazing and I can't believe it has soy in it! I am in korea at the moment as an after-school English teacher. This recipe caught my eye because the one-room apt. they provided me with does not come with an oven, only a stove. Also, I teach in an area known for its strawberries (Samnye, in Wanju). What an amazing-looking treat! If I could replicate this, i would in a heartbeat with strawberries fresh from Samnye. They are, without a doubt, the most amazing fruit I have ever eaten in my entire life. I love soy. Having it as dessert with strawberries is a great combo. I now declare u, a Superwoman. I wonder how u do it! (bake, photograph, work, cook, travel and blog!) SERIOUSLY. Travelling plus cooking plus blogging? Super woman! I love the colours of this pudding and best of all it is soy! Any substitute for cream? mmm.. These puddings are so cute! And they look really delicious too :) When I'm older and I get a job, I would LOVE to work somewhere designed by you :) Just looking at your food blog photos I can tell- you're definitely very good at making things pretty! Your colleagues are so lucky! Wow. The presentation is so beautiful. Great photographs as well! I would have gone "wah" too! Beautiful, shirley! And you are amazing. I don't know how you've kept up with blogging. My year has been crazy as well but at least I'm in the country, and still I've come close to giving up blogging many times! This pudding looks soo good! May i ask where can I buy these mini jars? Shirley, can i check where can i get gelatine sheets? Thanks! whr got sell little pudding jars...can tell me?